“I think of myself as a journalist,” says Wayne Alaniz Healy, a painter, sculptor, muralist and retired aerospace engineer who understands the passion and political power of art. Through his art he faithfully records daily life as well as the political upheavals of his long-time home in East LA. A career in the aerospace industry took him across the country before returning to California in the early 70s. 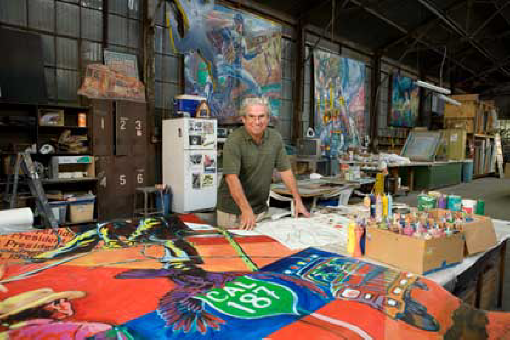 Responding to the burgeoning and, at times, explosive Chicano quest for a political voice, Wayne became deeply involved in the East Los Angeles mural movement and co-founded East Los Streetscapers. Vibrant colors and intense, lively scenes emphasize his devotion to family and community. Healy designed the sculpture that aesthetically unites Olivas Adobe Historical Park and the Olivas Links Golf Course in Ventura, CA. This artist participated in PACIFIC STANDARD TIME, an initiative of the Getty with arts institutions across Southern California.